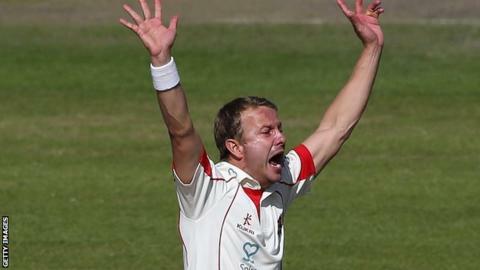 Lancashire debutant Neil Wagner claimed a match haul of 11-111, backed by three wickets for James Anderson, to set up a probable final-day victory over Nottinghamshire at Old Trafford. The hosts had earlier lasted 31 balls to add a further 21 to their overnight score as they were bowled out for 332 - and a first-innings lead of 90. After making it to lunch without losing a wicket, Notts then collapsed. Wagner took 5-45 and Anderson 3-29 as the visitors were bowled out for 175. In their first game since winning promotion back to the top flight, that will leave Lancashire chasing 86 to win on the final day. New Zealander Wagner took the headlines but, from an England perspective, Anderson's efforts were perhaps more important. While strike partner Kyle Jarvis's analysis read 7-5-4-0 at lunch, Anderson conceded just nine runs from six overs and his second spell was even more impressive. Having bowled well without luck in 16 wicketless overs in the first innings, he this time began the rot when he bowled former Lancashire team-mate Steven Mullaney with a ball that kept low, bowling unchanged for 11 successive overs after lunch from the Pavilion End. Having gone past the outside edge on numerous occasions, he did get further reward later, trapping Riki Wessels leg before as well as getting last man Harry Gurney caught behind. But, in between, Wagner was again doing the main damage, claiming another 'fiver-fer' to follow up his first innings 6-66 for a memorable debut. Earlier, Lancashire's other impressive debutant Liam Livingstone had added just seven to his overnight score before he was out lbw for 70 to give Jake Ball a fourth wicket, while Jarvis was caught at slip for 37. "Neil Wagner was fantastic again. To take 11-for on his debut is something pretty special. He should be really proud of that. It couldn't have gone any better for him. "He is a fantastic guy, he loves playing, he wants to do well for the team and has so much energy on the field. He never turns down the opportunity to have a bowl. "He may lose a few inches in height if he keeps bowling on these wickets, but he has a fantastic attitude and is someone we are lucky to have in our dressing room. "The pitch is as good as a Test pitch. There hasn't been a huge amount there for the seam bowlers. We knew we had to work hard for our wickets but stuck at it and got the rewards." "When we went out to bat, we knew we had to make about 300 to be competitive but we're a long way short of that and we need a minor miracle on the last day. "We need something like a Stuart Broad 8-15 now. You feel in these situations you need to set a minimum of 130, 140, 150 but we've failed to do that. "Throughout the game the top six have under-scored. We're disappointed with that because we had first use of the pitch and we wanted to bat first. "Fair play to Neil Wagner. He's had a terrific game, he's run in hard and bowled bouncers and yorkers and mixed it up and been very effective."